Haiti is to receive $10 million dollars for feeding programs World Bank Group President Robert B. Zoellick’s announced Sunday, after his calls to ease global food shortages were endorsed at this weekend’s World Bank/IMF Spring meetings. High commodity prices and their impact on growth and development were to be included on the agenda of the G8 Finance Ministers’ upcoming June meeting. But that is too late, says Mr. Zoellick, who is urging immediate action to put food in hungry mouths. World Bank estimates predict that 100 million poor people risk being pushed deeper into poverty by the doubling of food prices in the last three years. During the meetings, the Bank decided to give an additional grant to Haiti, where there were recent reports of people eating mud. New violence has broken out in the country even as international peace keepers seek to maintain calm. 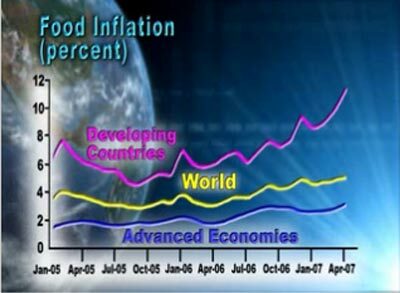 During a press briefing (April 10) in Washington, D.C., to mark the start of the IMF/World Bank Spring Meetings, Zoellick warnd that rising food prices had set back the fight against poverty by about seven years. Zoellick said food prices would be at the top of the agenda. He said in Bangladesh, a 2 kilogram bag of rice now costs almost half the daily income of a poor family and the price of wheat has risen 120 percent in the past year.